Own A Luxury Lifestyle Inspired by Shapoorji Pallonji. Shapoorji Pallonji Alpine: Welcome to a world luxury and comfort redefined! Mumbai is an incredible city that has a lot to offer its inhabitants. Being the economic capital of the country today, Mumbai is a city that offers every individual a chance to turn a dream into reality. Known for its high-end infrastructure, transportation, education hubs, career opportunities, nightlife, glitz and glamour, mixed culture and more, Mumbai is one of the most loved cities in the country today. Without a doubt, once you step into Mumbai, you will never want to step out! The real estate sector in Mumbai is thriving with a number of residential as well as commercial projects throughout the city and its outskirts. If you are looking out for state-of-the-art luxury, look no further! 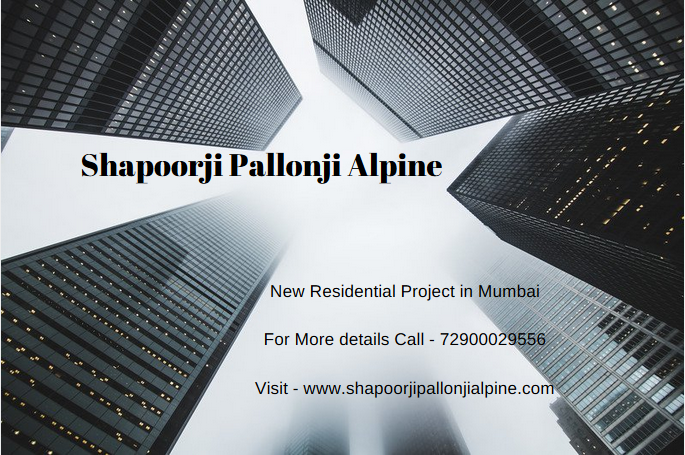 Shapoorji Pallonji Alpine is an impeccable residential project in Mumbai by Shapoorji Pallonji Group that offers flawless features for a modern and well-endowed lifestyle.Shapoorji Pallonji has always offered premium architecture and this development is nothing short of it! Spread over vast acres of land, this residential development consists of fabulous twin towers that offer 2BHK and 3BHK luxury apartments that are Vaastu-compliant and designed to please.The apartment carpet areas start at 768 sq. ft. and go up to 1047 sq. ft., providing maximum space to meet all your needs, requirement and will always make you feel free! Shapoorji Pallonji Alpine Mumbai is an exquisite residential development that offers the highest level of luxury and comfort through its wide range internal and external amenities that are truly world class! The apartments are spacious, provide beautiful air-flow in every room, ample natural lightingand contain high-end fittings & fixtures, vitrified flooring, RAK/laminated wooden flooring in master bedrooms, premium doors, wide balconies and windows providing jaw-dropping landscape views of Mumbai City, rich modular kitchens with dishwasher and multiple provisions, high-quality electrical ports and switches, safety facilities and the list goes on. The external amenities at this development are mind blowing and packed with fun and excitement that will rejuvenate you each day! They include a grand clubhouse, hi-tech gymnasium, swimming pool, meditation centre, multipurpose hall, multiple sports facilities and a play-area for your kids, fancy sit-outs to spend time with family and friends, gorgeous landscape garden, efficient car parking facility, power back-up, swift lifts, designer entrance lobbies, Integrated Building Management Systems and high-end security with video surveillance. In order to conserve water for a better tomorrow, this development also takes up rain water harvesting. Situated at Kandivali in Mumbai, Shapoorji Pallonji Alpine Kandivali has all of your everyday and emergency landmarks in close proximity and offers a life of convenience that will be loved by one and all! Places like schools, colleges, institutes, banks, ATMs, medical centres, hospitals, malls, supermarkets, convenience stores, cinemas, automobile showrooms, restaurants, cafes, clubs, lounges, public transport and a lot more can be accessed without worrying about long-distance journeys. In fact, no place is hard to find when residing at this development. The strategic location of this development also offers easy connectivity to other locations in Mumbai. Starting at a price of Rs.2.11 Cr. and moving up to Rs.2.80 Cr., the apartments at this development are affordable and too hard to resist! This development lets you purchase your dream home without worrying about a load on your pocket.If you are looking out for a new home or an investment in Mumbai, this development is your ultimate destination! You can conveniently chose from numerous payment plans available along with easy home loans at decent interest rates, NRI services, customer support and more for a purchase that will be loved for generations to come. Book your apartment today and experience a life in Mumbai like never before! Located at Kandivali East, Mumbai. 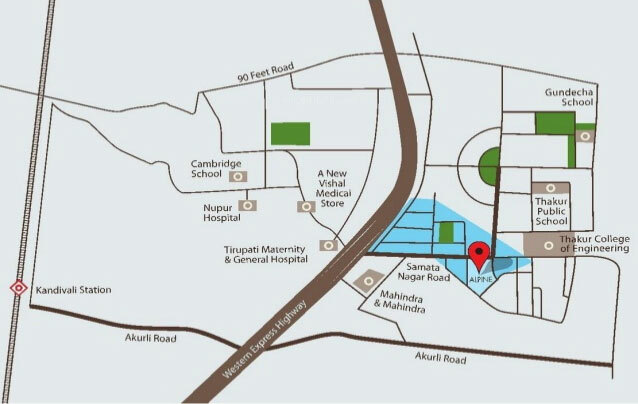 Renowned Malls, Schools and Colleges, Multi speciality hospitals within 5-7 km. radius.